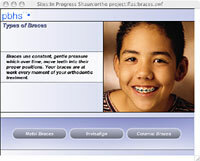 Braces use constant, gentle pressure, which over time, move teeth into their proper positions. Your braces are at work every moment of your orthodontic treatment. The two main components of your braces are: the brackets that are placed on your teeth and the main arch wire that connects them. The bracket is a piece of shaped metal or ceramic that we affix to each tooth. The arch wire is bent to reflect your “ideal” bite. In other words, it reflects the way we want you to look after treatment. To discuss getting braces please feel free to contact us and schedule an appointment. For a brief narrated overview of the different types of braces, please click on the image below. It will launch our flash educational Module in a separate window that may answer some of your questions about different types of braces. The wire threads through the brackets and, as the wire tries to return to its original shape, it applies pressure to move your teeth. Picture your tooth resting in your jaw bone. With pressure on one side from the arch wire, the bone on the other side gives way. The tooth moves. New bone grows in behind. Self-ligating metal brackets reduce friction between brackets and wires by eliminating use of ligature ties. High tech wires produce gentle, steady forces, together they will reduce total treatment time. Cupertino Dentist Dr Robert Harley offers general dentistry and orthodontics including Tooth Fillings, Dentures, Dental Bridges, Dental Crowns, Porcelain Veneers, Dental Implants, Tooth Extractions, Gum Disease Laser Therapy, Teeth Bonding, Root Canal Treatment, Braces, Orthodontic Retainers and Appliances and Clear Braces to treat damaged teeth or uneven smiles.